Pacific Internet provides Business Class VOIP; A VOIP service unmatched by any Hosted VOIP solution. 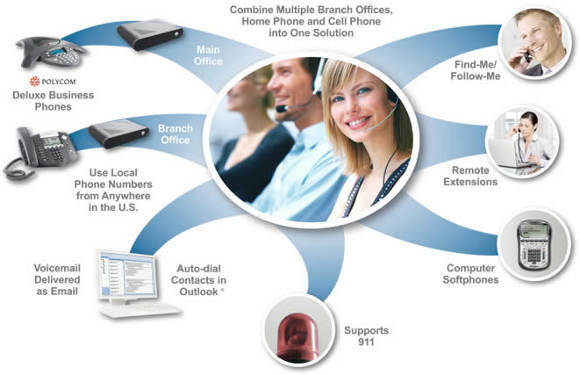 With Pacific Internet Business Class VOIP, you get your own dedicated and managed PBX phone systems. No sharing your PBX services with several other companies on a shared server. With QoS optimization, customized from end to end on our network*, we can offer best of breed call clarity. Pacific Internet is very adept at increasing efficiency and decreasing overall costs for small businesses. Whether you want to keep your existing phones or increase functionality with IP phones. Each IP PBX implementation is custom tailored to suit your Business needs. The ability to never have to deal with the phone company again. * With Pacific Internet Broadband and VOIP. Pacific Internet can ensure highest quality of service and clarity when bundled with Pacific Internet Broadband Connectivity products.